Stant Lever Vent Radiator Cap 16 Psi 1993-up Dodge,Chrysler,Jeep Stant Lever Vent Radiator Cap 16 Psi 1993-up Dodge, Stant Lever Vent Radiator Cap 16 Psi 1993-up Chrysler, Stant Lever Vent Radiator Cap 16 Psi 1993-up Jeep, Stant 10330 Radiator Cap, Dodge Challenger Radiator Cap, Dodge Charger Radiator Cap, Chrysler 300 [Stant 10330 Radiator Cap] - $8.99 : 3rd Strike Performance, Your Source for Late Model MOPAR Performance Parts and Accessories! 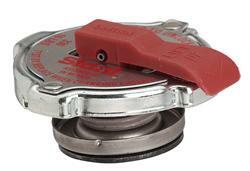 Improve your safety quotient with these Lev-R-Vent radiator caps from Stant. Lev-R-Vent radiator caps feature a unique pressure release lever that vents pressure prior to removing the caps, reducing the risk of injury. These caps are designed to easily fit in the smaller spaces of today's engines.